483 km (300 miles) off Vietnam. Photo was taken by a crew from the deck of the Ptolemais (May 27, 1977). I have lost contact with many of the crew members of the Ptolemais over the years . For many years, my mails sent to the ship owning company never reached the crew members (I recently found out that the company stopped operating since 1982). I also regularly searched my local newspapers maritime section to see if by chance the Ptolemais would dock in San Francisco, but to no avail. 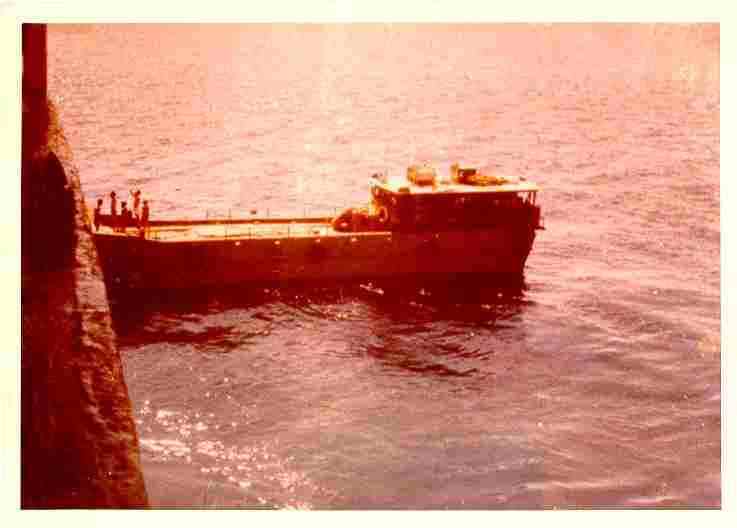 In June 2000, I wrote to nearly 20 shipping companies, shipping agents,� the Consulate of Greece Shipping Department in Vancouver (I found the contact by chance while browsing the Internet) to inquire any information about the Ptolemais and its crew. But there were no replies, and I almost gave up hope. Finally, on the morning of August 22, 2000 I received a phone call from Mr. Jiatras Denis from the Rescue Center of Piraeus, Greece, informing me that based on the information I sent to the Consulate of Greece, he spent days searching� and found the contact of Captain Loizos Stavros but learned that he had passed away in 1993 (Mr. Jiatras personally went to the neighborhood where captain Loizos used to live. His surviving family has moved to an unknown address), and he also found the contact of the Chief Officer Mr. Nick Moutsatsos who currently lives in Piraeus. I immediately telephoned Mr. Moutsatsos and our conversation was one of most joyous and touching moments in my life. I made a promise to stay in touch with Mr. Moutsatsos for years to come. My efforts in the last 18 years searching for any crew member of the Ptolemais have finally paid off, though I will continue to locate more. My heartful and most sincere thanks to the Consulate of Greece Shipping Department in Vancouver for their kindness, and especially to Mr. Denis Jiatras of the Rescue Center of Piraeus who personally dedicated his times and efforts in locating Mr. Moutsatsos. This is in dedication of Captain Loizos Stavros who is in the safe hands of God,� and all the crew members of PTOLEMAIS. 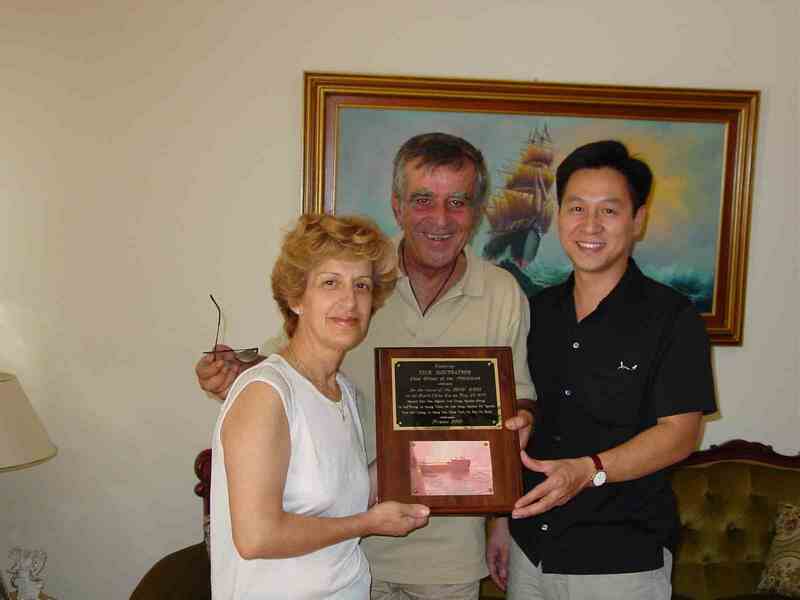 September 2001, I flew to Greece to present a plaque, on behalf of the crew of Dong Khoi, honoring Mr. Moutsatsos with his lovely wife by his side. Mr. Denis Jiatras also joined us to celebrate the special occasion.